Metrorail will offer late-night service through 3 a.m. on New Year's Eve, the transit agency announced Thursday. There will be no scheduled Metrorail maintenance over the Christmas or New Year's holiday weekends, the Washington Metropolitan Area Transit Authority (WMATA). Christmas Eve, Christmas Day and Dec. 26: Metrorail will run from 7 a.m. to midnight each day. Off-peak fares will be in effect all day; parking will be free at Metro garages and lots. Metrobus will run on a Saturday schedule Dec. 24, and on a Sunday schedule Dec. 25-26. New Year's Eve: Metro will open at 7 a.m., with special extended service on all lines until 3 a.m. (technically, Jan. 1). "We are pleased to offer special late-night rail service again until 3 a.m. on New Year's Eve," WMATA General Manager Paul Wiedefeld said in a release. "I view this as an important public service for the benefit of riders and the communities we serve." New Year's Day and Jan. 2: Metro will open at 7 a.m. and close at midnight. Again, off-peak fares will be in effect all day, and parking will be free at Metro garages and lots. Both Metrorail and Metrobus will run Sunday schedules. WMATA is reminding riders that last train departure times vary by station; riders can check the times on their preferred station's webpage (see a list of all stations here) and adding three hours to the regular last train time. 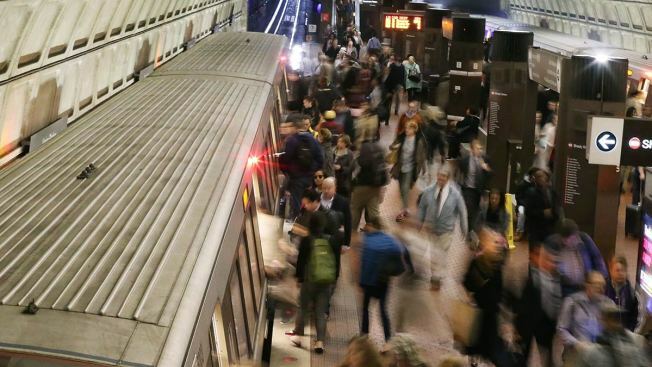 The transit agency had previously announced its aggressive SafeTrack repair plan would be paused from Dec. 20 through the end of January for inauguration preparations. On Inauguration Day, Jan. 20, Metro will open an hour early, at 4 a.m., with near rush-hour service levels on all lines through 9 p.m.
WMATA will release information on 2017's SafeTrack surges in early January, it said Thursday.